This is the first year we’ve put Christmas lights up on our house. I frequently did it growing up (not too hard in California because it’s always warm!) but this was the husband’s first experience with outdoor lights. I bought 5 boxes of LED icicle lights last year after Christmas. Of course they were half price! (I refuse to buy anything Christmas related unless it is at least 50% off.) Anyway, I can’t remember if LED were the only ones they had or if I was feeling very concerned about the environment at the time. I’ve never had LED lights before and well….they are, what’s the word? Bright? They didn’t look so bright during the day when were were putting them up (and freezing our buns off, by the way!). But holy brightness batman! Our eyeballs were temporarily shocked. You can see these suckers from a mile away. So, what’s the problem you ask? Well, I’m not so sure I’m sold on the look of the LED lights. They are super white and therefore make traditional white lights look yellow in comparison. So I can’t light our two mini trees by the door because they have traditional lights so they look dingy. I tried to capture the brightness…but I sort of failed. But you get the idea right? 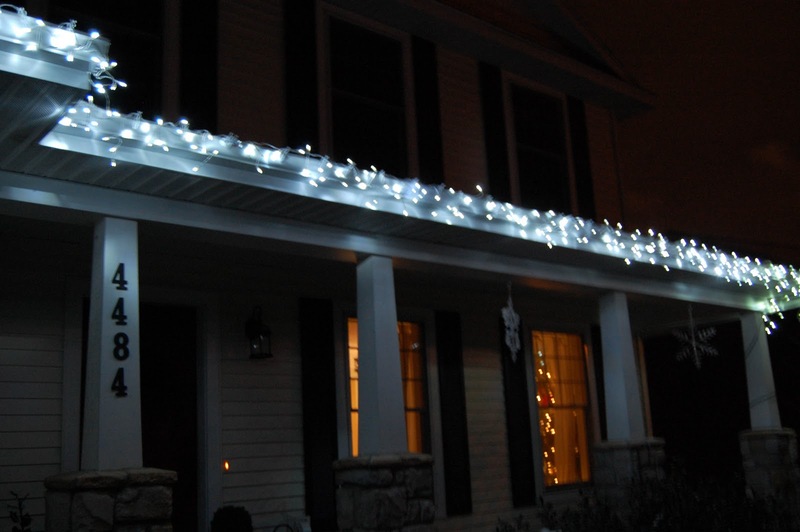 The lights are also super tight…so they don’t hang down like icicles like I wanted them too. I mean, I’m all about doing what’s best for the environment….but can’t they make normal looking LED lights? So am I being overly picky? Do they look good or weird? One minute I think they look awesome and the next minute I think they look crazy. I was feeling a little self-conscious about our bright lights so I scoped out all the houses around us. And there are ZERO houses our neighborhood with LED lights. Flashing lights mixed with non-flashers? Check. Every color of the rainbow lights? Check. Lighted snowmen and reindeer? Check. Cute normal icicle lights? Check. LED lights? Just our house. 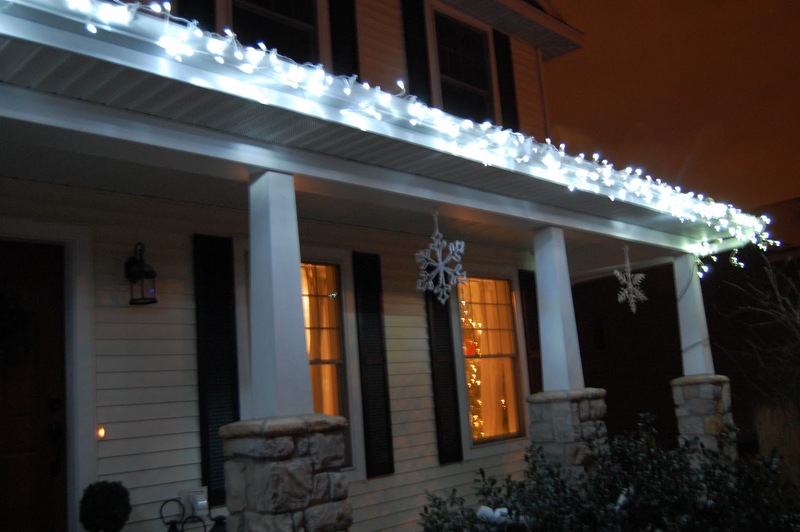 The lights are staying up this year…frankly because it is way too cold to take them down. But as for us putting them up next year? I can’t decide. So I need you to be honest with me! Yes or no to the LED lights? woah. holy batman is right. maybe if you leave them on for a few day's they'll burn out and down to a normal level. ok who am i kidding that isnt going to happen. i vote colored lights on the trees and they wont look dingy. . they'll look colored! Wow, I'm impressed! They are bright but they look pretty. 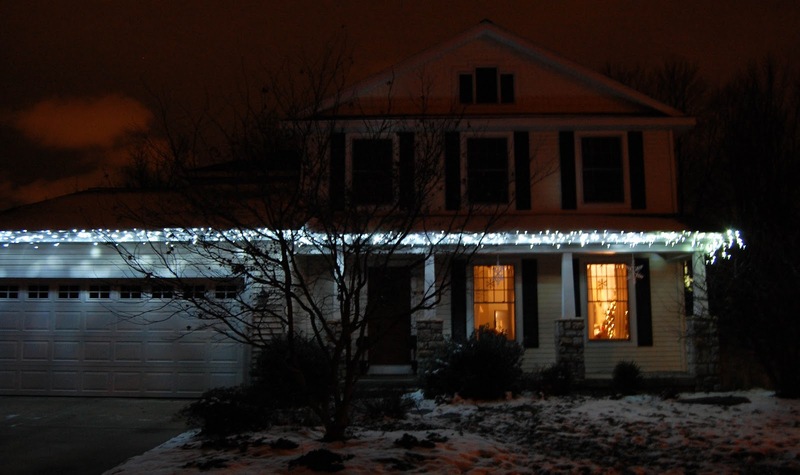 The fact that no one else in the neighborhood has LED lights is not surprising….remember, you are in Michigan!!! You're just ahead of the curve! I've seen a lot of these in CA, but we're trendy that way!! I reserve judgement until I see the house in person….see you 12/24!! I've always been ify on LED lights and my sister swears by them, but I love yours. I like the bright white color that it shows. I do agree that you can't mix regular lights with LED lights. I say keep them and add on next year. I think they are pretty!! They don't look like "normal" white lights but they do look festive and beautiful! But I can tell what you mean about brightness! I like the LED lights. My brother agrees and they are better for the environment. I like how they look a little blue/white. Girl, I'm right there with you! I just will not get LED lights until they can make them look more traditional. I had the same issue with CFLs for a while, but they soon came out with ones that looked more incandescent-y. Maybe next year the Christmas lights will catch up? I've always preferred the "warm" traditional white lights, but Mike (being an engineer and in love with all things high tech) REALLY wanted cool white lights. Since I don't care that much, I gave in and also felt my retinas burn. However, I have received a number of compliments on the color. Everyone wants to know where I bought them. Target, of course. My only sticking point, light clips. I cannot stand to see my lights going every which way.